This morning I am thinking that all things fall sound pretty good. 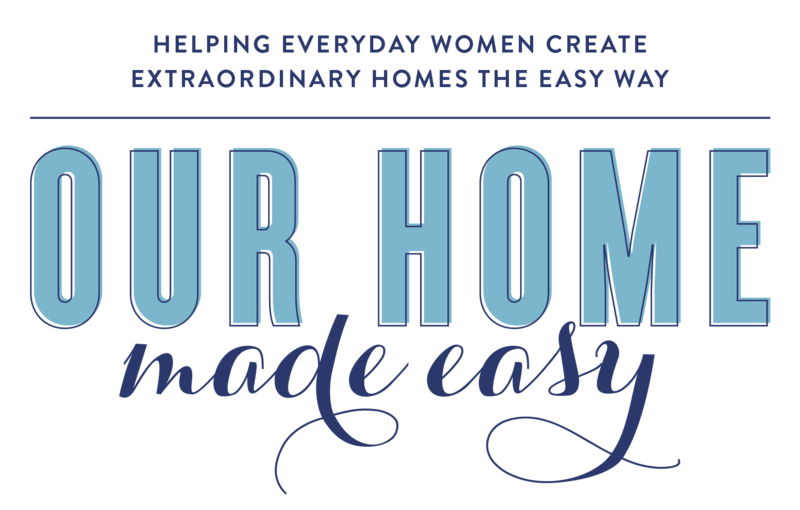 We started several projects this weekend and if you haven’t already started your own, don’t forget to look at my 15 Favorite 1 Hour or Less Fall Projects! 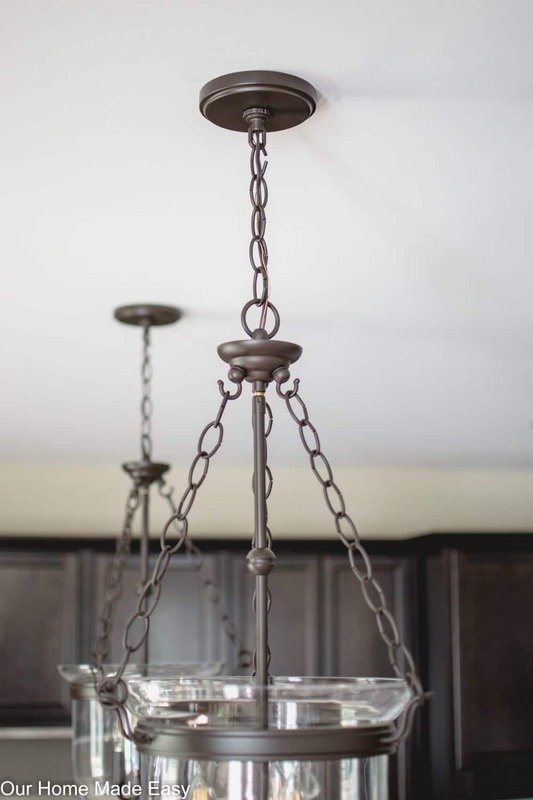 In between fall project planning this weekend, we updated our kitchen island pendants– I couldn’t wait to show you! Jordan ran to Lowe’s a few weeks ago for more supplies for the mudroom. 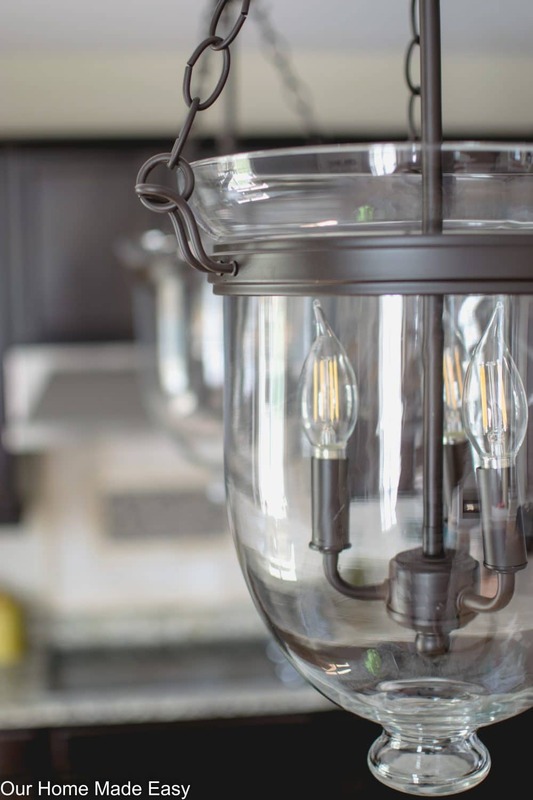 While he was there, he noticed a beautiful pendant on the clearance end-cap (you know the ones in the back that people always walk by…) and saw that the light was marked down from $129 to $30. Being a great a hubby, he snapped a picture of the clearance lighting and showed me when he arrived home. You guys, he’s the best. And me? Well I love a great deal. So I ran back over to Lowe’s (it’s less than a mile away from our subdivision) and found the light. AND THERE WERE 2! So naturally, I picked up both. 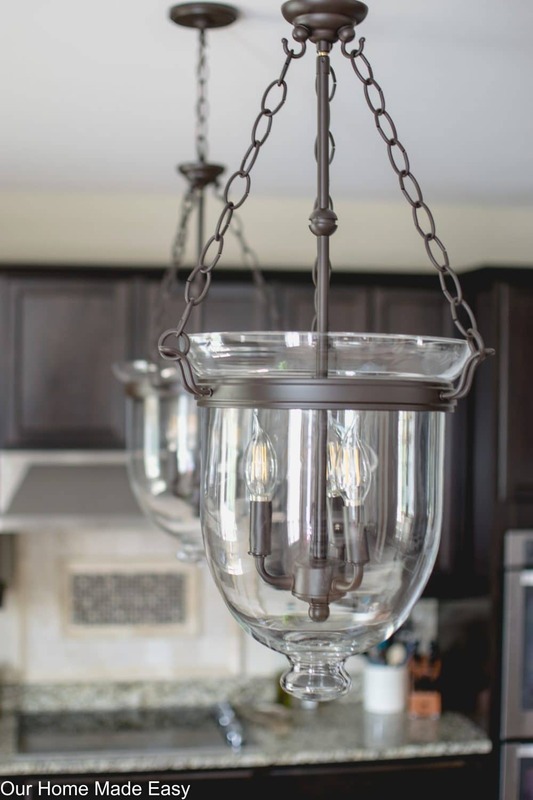 These are an exact knock-off of these kitchen island pendants from Pottery Barn. We managed to score them for more than 90% off the PB price! 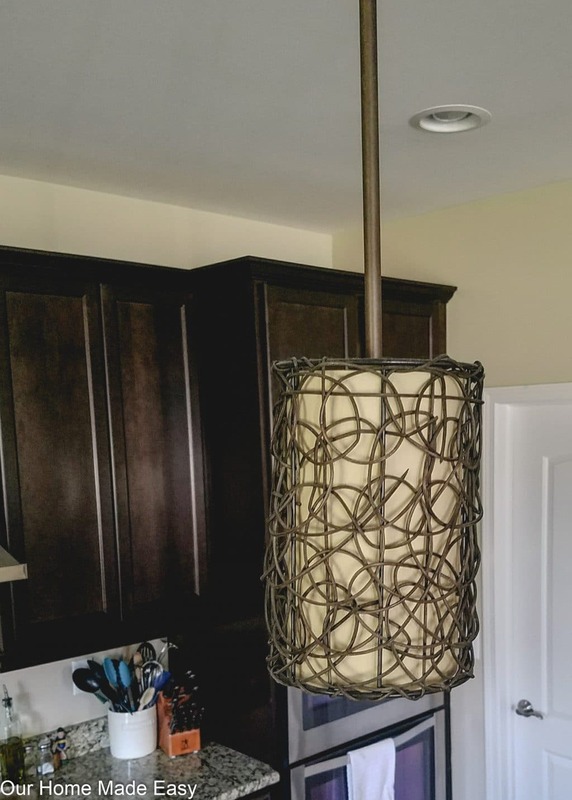 The Kitchen Island Pendant Before…. If you don’t recall, here is what we changed out the builder grade lighting to a few years ago. 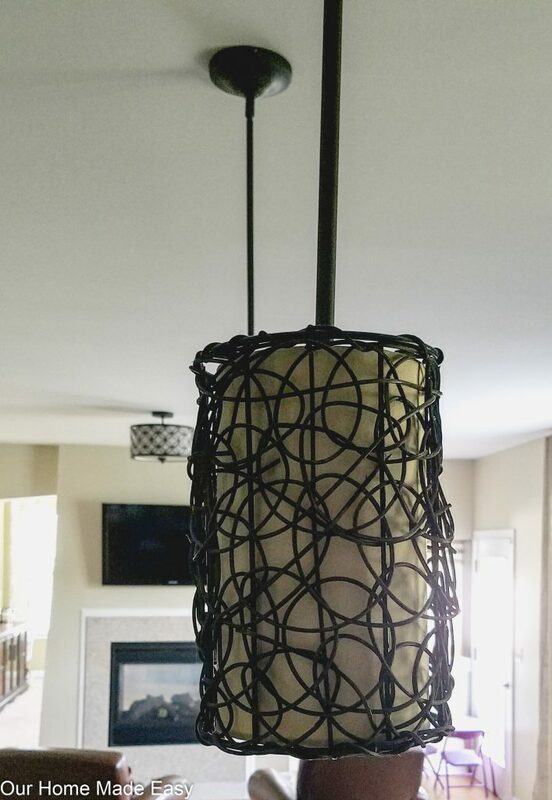 Jordan installed down rod pendant lighting kits and added these wicker shades. There are two pendants above our island and another above the sink. and the ones we found for 90%+ cheaper…. It turns out that these lights were more than likely special ordered and returned which caused the ultra-low pricing. While anyone can still buy them online (and I might need a 3rd), they were reduced to move them out of the store. Find them online here. We unpacked one of them to see if it would work well in our mudroom. Jordan removed the mudroom lighting and raised his arm high so that I could get an idea for how the pendant would look. I immediately thought it needed to be hung almost flush to the ceiling and it need to be painted black. Jordan wasn’t loving my painting over a brand new fixture and the possibility of anyone over 6′ hitting their head on this lovely pendant. 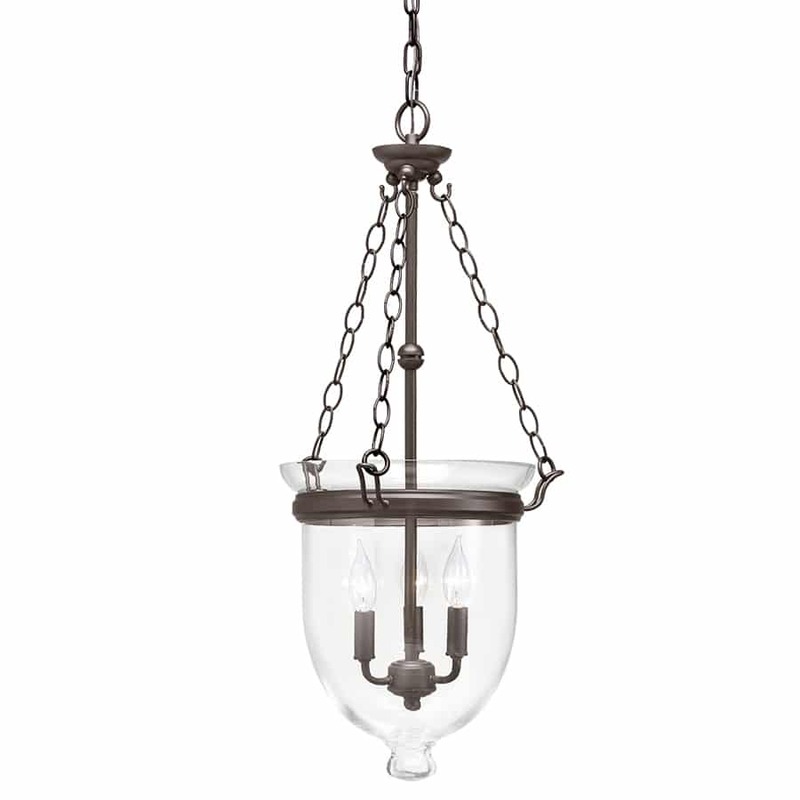 Jordan really loves the current pendant lights and I liked them at first too. But as we’ve grown into finding what we really like for our tastes. I thought we could do better. And boy were these guys going to make our kitchen island look ahhh-mazing. 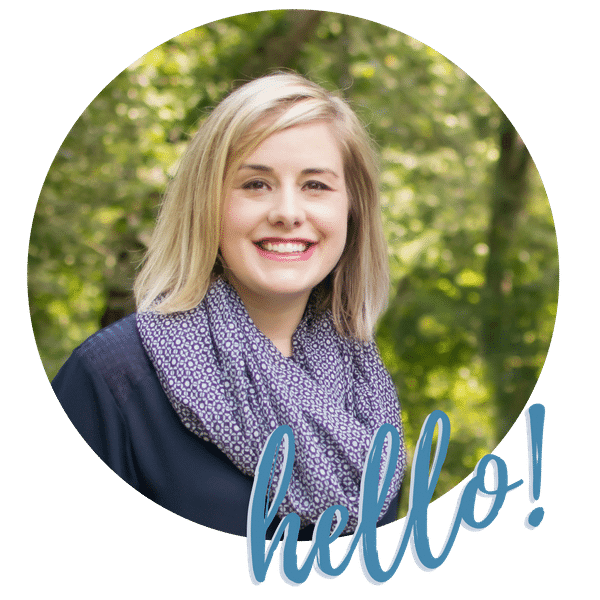 But only on one condition…. Jordan said he’d hang the new pendants (and not return them) if I could manage to sell the current ones. Challenge accepted. I sold them that morning and on Friday night, these new lights were on their way up. Yay! While I haven’t found a replacement yet for the area above the sink– it will be a work in progress. Oh– and the mudroom still doesn’t have a light hanging. Priorities, right? 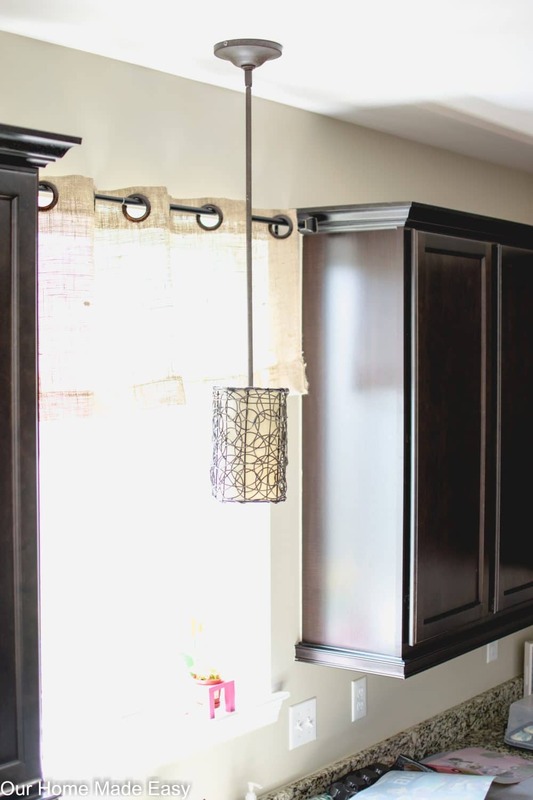 What do you think about the kitchen island pendant lighting? Do you like the older ones or the new pendants better? The old ones were nice but I love the new ones! Gorgeous!